Chad Chebultz never planned on ending up in Abilene Kansas. A missed turn or mistake reading a map led him to the town he now calls home. At the time, Chebultz was in the collections business. But motorcycles had been a part of his life in the past. He was a successful flat-track racer with three national championship wins under his belt. Then it all changed with an accident in Paducah, Kentucky. Chebultz suffered a head injury and decided that along with seeing two close friends injured that year, that was enough for him. He quit riding but still considered motorcycles art. Chebultz reinvested his profits and the business took off from there. Chebultz saw a need for parts for older motorcycles and found a way to manufacture these through partnerships with other companies. Chebultz has been very successful and has built his business to include nine full-time and two part-time employees. Keep up-to-date with everything in the Abilene Kansas Community!! GET The Free Mobile App HERE. The Vintage Spoke is one of the largest providers of NOS, Yamaha XT, and TT500 parts in the world! We started our business working out of a small 10’ x 20’ garage. At the time, there weren’t many businesses offering the products and services we required to restore motorcycles. Recognizing a much needed niche, we began having our own vintage motorcycle parts manufactured. Today, we offer over 15,000 motorcycle parts, and other merchandise, from our 10 acre, 20,000 square foot facility in Abilene, Kansas. 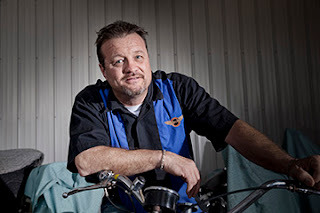 Our world renowned reputation for motorcycle restorations, exceptional quality products, and unparalleled customer service continues to makes us a leader in this industry. Drawing upon our grass roots beginnings, as well as over 60 years of combined experience, our friendly, knowledgeable staff goes above and beyond to provide our customers with the best shopping experience available!